Whilst breezing through the archives I came across this, from a 2009 trip to Shanghai. A history of the transference of meaning might be in ionic order: from Hermogenes of Priene to Vitruvius’ presentation of De Architectura to Augustus … the fluting here is Roman, not Greek. We could drop in at the role of Athena in the Renaissance period’s naturalisation of the ionic order for the construction of universities, places of governance and libraries. But where now? Where to, here? To put it bluntly, what in Shanghai are we to make of the ionic today? In this configuration the portico is a dim memory, and the literary works of absent graffitists have been violently smothered. 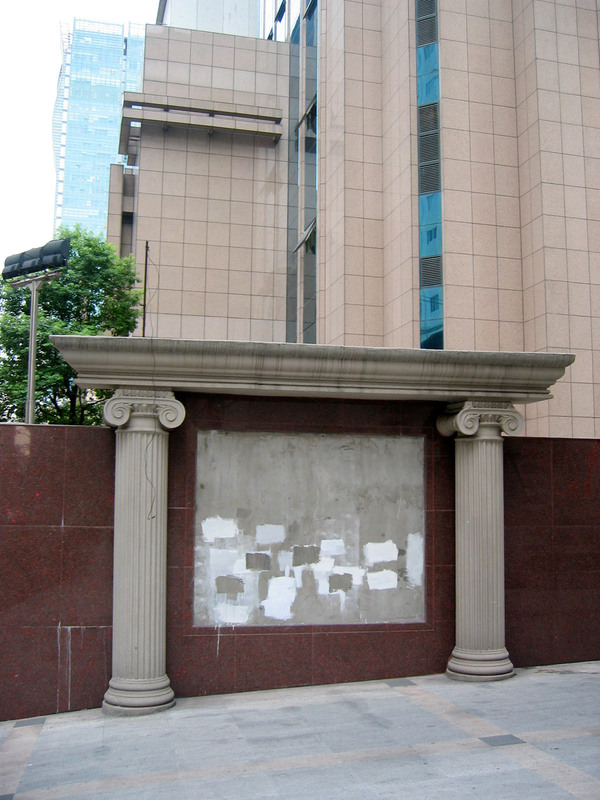 The perimeter wall of a corporate building-site demotes marble to junk-panelling, and local topography is given more sway than the mandate to create space. Manufacturing makes it possible: the un-tapered columns are tubes and can be cut to length. Clearly though, my European mindset was diminished currency in modern China. In Shanghai I was doubly illiterate: verbal and written clues were beyond my understanding, and my semantic crutches buckled under the weight of new epistyles.